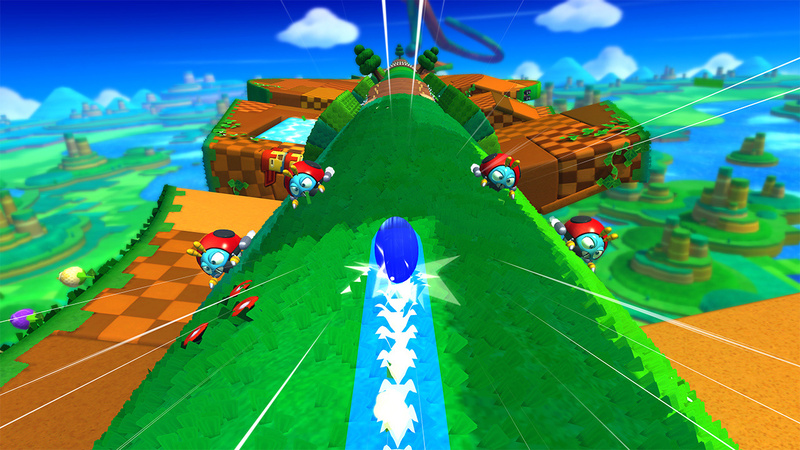 Sonic Lost World was one of a small batch of major Holiday season releases to push the Wii U in the retail market, though the Nintendo-exclusive title was also available on the 3DS. Both games were different experiences — as is likely to also be the case with Sonic Boom and its separate development teams — and Sega Sammy's latest financial reports provide figures on the worldwide sales performance of Lost World. As of 31st December 2013, Sonic Lost World (Wii U and 3DS) had sold 640,000 units worldwide, making it the second-highest selling new major packaged video game for the company, coming in behind Football Manager 2014 on PC. Those numbers represent just over two months of sales from the October release, and it appears to be the case that the 3DS version accounted for over 50% of that figure. In a tentative comparison, the multi-platform Sonic & All-Stars Racing Transformed sold nearly one million units in its launch window in 2012, with 260,000 of those units being on Wii U; at the end of that financial year the number of Wii U sales for that title had progressed to 310,000 units. As for Sonic Lost World as a Wii U and 3DS exclusive, those numbers aren't too bad, coming in just 40,000 units behind the popular PC football management sim. They may not be the numbers that Sega had in mind, nevertheless, and fall well short of first-party sales — on Wii U — that saw a number of Nintendo titles pass one million sales on the system; Super Mario 3D World was the Wii U standout with 1.94 million sales up to 31st December. 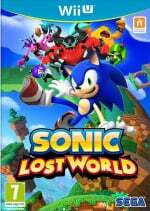 What do you think of these sales of Sonic Lost World? Good, bad, did it deserve higher numbers? Let us know in the comments below. Considering how bad/middling the reviews were, those numbers aren't bad. Bad sales. And if you compare them with those of Colors, even worse. I've only played the 3DS demo but it wasn't fun at all. The fact that there was nowhere to be seen at the stores and the lack of marketing... it sold more than it should've. I realise others seemed to disagree with me, but Lost World on Wii U was possible my favorite game of last year. What hurts is that so many of the reviews didn't seem to be by people who had bothered to find out what all the little buttons on the controller do. @DarkCoolEdge Considering how much people complained about this game no it isn't. Don't like the 3DS version go get the Wii U copy some day. The game is fine people like you just complain to much. I love lost worlds and im a little saddened that boom wont be expanding on the tubular level design. The wii u vers was fantastic, i only played the 3ds demo and didnt care for that vers, but the story and the sinister six were lackluster. The biggest downfall with lost worlds for me were the shoehorning of the wisp power ups and some of the onrails 2d stages later in the game requiring perfect timing tho they remedied that with the 100 rings equate a 1up patch. When I'm playing Lost World my mood constantly shifts back and forth between hating it and having lots of fun. Would like to know the actual Wii U-3DS split. Nice, pretty good sales. Thought it did worse. Encouraging. Lost Worlds put me off as soon as I knew it was a hybrid of Sonic & Mario, hopefully the New Sonic captures the magic of the original Sonic games. Sonic Lost World is my favorite Sonic game so far. I don't know why so many people hate it. Maybe all they want is to BOOST WIN. @banacheck "All new performers are clones of Mario" actuality play the game. I actually really liked Lost Worlds up until abut the half-way mark. As the stages difficulty ramped up and started requiring pin point accuracy, the weakish controls really started to show. I walked away from it during the 5th world but enjoyed it up until that point. The Nights and Yoshi bonus stages were excellent though! I played the demo for a few minutes then deleted it. 3D Sonic games are all just 'meh' to me. This one was no exception. Are there really that many Sonic fetishists left out there? Man, if 3ds accounted for more than 50% of sales, than that means the Wii U version probably only sold about 200,000 copies. That's piss poor man. No wonder 3rd parties are scared of Wii U. A exclusive Sonic game can't even sell well. Oh, that's actually really bad (for Wii U)! I wish that it sold better, it's a unappreciated gem! A bit like the first Luigi's Mansion, but harder. Oh yeah, I completed the game before the patch. It was mad! Any mention of the 2nd new level? And it was really stupid to limit the Yoshi level. It was short and it was fun but I only got to play it twice. Why do that? Maybe if they put out a greatest hits version this year w/ the Nights levels and the bonus DLC and the patch they can pick up a few more sales. Not bad considering the critical reception Lost world got. I'd be interested in that Football Manager game on the Wii U!! Sonic has just never appealed to me. The game I liked most with Sonic was on Master System ..that's about 17 Years ago..
Bought a sealed Deadly Six Edition from Ebay for pretty cheap but haven't got around to it yet. Interested to see if it is as bad as some say it is. Those are impressive numbers when you consider Sonic Lost World is considered by most reviews to be somewhere between an average to bad game. 3DS demo was awful. like really bad awful. Since the number is split between WiiU and 3DS, I guess it's rather bad news. The game isn't bad, in fact it's rather good, but it just seems to lack something. Above all, the graphical style was terrible. Sonic shouldn't go retro, particularly not with pixelated textures (the water in those tube-levels anyone?). But it was also lacking in speed. Lastly, there are way too many 2D elements. It was definitely a step back from Sonic Colors. I was interested in this till I read all the reviews. I'm surprised so many people actually bought it. It may be a third party game, even an exclusive, but we are not stupid enough as to buy crap. As simple as that. They have to try harder if they want us in - It's just my opinion, I love ZombiU, for example; TW101 doesn't appeal to me, not big fan of action games, I'd much prefer another Little King Story. I really like Sonic Lost World on the 3DS. It's majorly flawed, but it's definitly one of the best portable Sonic games I've ever played. Aside from the cinematics which look like crapola. @SecondServing What? Half of 640,000 is not 200,000. It's 320,000. Honestly for this game, which has many flaws, was very enjoyable and Deserves the number it has. I wouldn't be surprised if the Wii U version sold more since it played much better than the 3DS one. @FullbringIchigo Now THAT was the most rage inducing moment! I'd just finished collecting all the Chaos Emeralds the weekend before the patch was released. @alwaysasn, just saying, but you know, seeing that a game has got a 63 in Metacritic doesn't encourage one to spend such amount of money... Specially when there are some platform gems around (Mario and Rayman, 93 and 92, respectively), and another one on the way. But well, you are right, I'll give it a try someday, when it gets cheaper, and judge it by myself. Lost world is the best 3D sonic game ever made so far, The only reason a lot of people didn't like it, is because it was tough to master and there was no boost button. Although I will agree with one comment on here, they should should have left out the colour powers. The just didn't seem to fit in with this game. Yet The Wonderful 101 only sold 17 copies. What a world. @DarkCoolEdge I really liked the demo once I realised it was better to use the dpad. Group think mentality has meant I haven't bought it yet though. (I get the impression it is somehow fundamentally broken). @I-AM-REGGIE What makes it better than Generations ? (Comparing the PC version working properly at 60fps). I am still surprised I am still playing it and I am getting more enjoyment the more I play it. (Whereas Nintendo stuff I play once and I never want to play them again ever). @chiptoon I agree, depite the bad reviews it is still a fun game. I love the asymmetric two player game modes with one player on TV and the other on the Gamepad. I bought a lot of games last year, mostly on Wii U, and this was one of my favorites. @MuchoMochi It said in the article that the 3ds version made up MORE than half of Sonic Flop World's sales. Please read the article before damage controlling. Thanks. @FlyingKickPunch Wonderful 101 was awesome. Deserves higher numbers, i love Lost World. High quality Sonic game if u ask me. Sweet. Really loved the game. My first Sonic game in a long time. Really hope it continues to sell, can't wait for Sonic Boom. Game looks beautiful. I enjoyed the crap out of what I've played so far in the WiiU version. It hasnt been too much though, I juggle lots of different games at once and only play in small bursts. Maybe it wasnt the sales they were hoping for, considering it's between two platforms, but it could've done a lot worse than "second-highest selling new major packaged video game". Better than I expected, really. Better than expected but still terrible. @DarkCoolEdge Depends how much it cost to make whether it is good or bad. Nintendo used 100 people I think they said for 3D World. How big is Sonic Team ? If the engine was the hedgehog engine and it already existed who knows. (Sega is making money hand over fist). @SecondServing yes I read that part, you assumed that the Wii U version sold maybe 200,000 copies based on a very vague percentage. although over 50% means more than half, it's usually said when the real percentage is anywhere from 50-60%. Otherwise they would have said a different percentage if the gap was larger. 200,000 is about 31.5%, so logically they would have said the 3DS accounts for almost 70% of those sales. I'm not on damage control, I don't work for SEGA. I just believe the Wii U version was the stronger version and should be celebrated for making however much sales it has. Did you enjoy the Wii U version or 3DS? @MuchoMochi The Wii U version. I was dissapointed to be honest though. It's not mediocre, but I just want Sonic Adventure 3 already. Hopefully Sonic Boom will be that. I'm keeping my hopes down low though. @SecondServing That's how I felt, it's not a game I'll come back to again and again. I appreciated it as another title for the Wii U though. I hope Sonic Boom lives up to the challenge, from what I've seen i'm excited. I'm being smart about it as well though, still hesitantly hyped though. I'm on the second world on the Wii U version, and to be honest, I can't stand it. I don't know why, but it's just not that fun to me. They need to make a game with the Sonic Adventure styled gameplay, because that's what eveybody wants. Anyway, those sales numbers are better than expected, IMO. In other news: Sonic Boom is looking great so far! I still want the Wii U one. Weird. Everyone who I knew that bought it said it sucked. Screw the Sonic haters and reviewers I'm still getting this when I get my money. You just need to practice playing the game and when you get better at it the levels will become more fun which is why Sonic games are awesome b/c you need to have skills to speed run through everything making it an enjoyable time like Sonic Generations, Unleashed(days),Sonic Adventure 2, etc. the source says 640k shipped. it looks like units shipped to retailers not sold to customers. very misleading. a tell tale sign the game sold bad. 3. Sonic games have good legs(hehehe) so it should rack up quite a few more before things are said and done especially if Sega uses sales to push digital copies when it starts running out of gas. These are fine numbers. Not a mind blowing success but definitely not a flop either. You clearly have only ever play Mario.. Considering there was next-gen, big AAA titles and crap reviews, there some good numbers. Least it'll prove Sonic is still loved with Ninty gamers. I personally really enjoy Sonic Lost World (Wii U, haven't played the 3DS one). I truely believe reviewers simply couldn't handle learning the controls. Which are kinda difficult, but in a fun challenging sorta way. The controls allow for numerous different ways to replay levels, it's awesome. Guess these numbers actually look decent to me because I thought for sure it did far worse. @PrincessEevee9 Excuse me? "People like you complain too much". I did not complain. I said I tried the demo and that I didn't like it, which is absolutely true. I didn't say it is a bad game. People like you complain too much about others opinions. See what I did? Good, I'd hate for this to fail hard. It can still do better, but it will. It's Sonic. I felt the demo for the Wii U version was pretty weak. I didn't get the impression I'd have any fun playing through the whole game so I think the sales are about right. The Wonderful 101 on the other hand, VERY underrated game that many negative reviews failed to even properly understand. It's a pity W101 has sold pretty poorly. Lost world wasn't a bad platformer but sinister six were awful along with the stupid things they say when sonic is about to face one of them. It is interesting that people either like or hate Sonic Lost World. One thing Sega has done wrong is to make Sonic Lost World a rather difficult game. Its difficulty is comparable to the old sonic games in the Genesis age. They should make the game as easy as Mario U and Mario 3D World. In contrast, W101 is a good game with poor morph drawing recognition. I was surprised by the difficulty of drawing morph accurately even though handwriting technology should be advanced nowadays. Given that Nintendo fans complain it so much, I wish Sega should export Sonic Lost World and Sonic Boom to other consoles except Wii U and 3DS so that Nintendo fans will not complain. Happy for Nintendo gamers. @GearsOfWarU Sonic Lost World is also the best Sonic games for me. I like it better than Sonic Adventure 1 and 2. Good for Wii U, terrible for 3DS. But the 3DS version is kind of terrible, so it's all good.